Singapore, 12 March 2016 – President Tony Tan Keng Yam officially launched the 16th President’s Challenge today at Microsoft’s We Tech Care 2016 event with strong support from the technology community. Aligned with Microsoft’s mission to empower every person and organisation on the planet to achieve more, We Tech Care 2016 goes beyond regular fund-raising to rally the local startup community, non-profit organisations, Microsoft partners and employees to collectively showcase the power of technology in creating a smarter and more inclusive Singapore. In addition to the over 200 volunteers from startups, non-profits and partner organisations, as well as Microsoft, the event saw close to 600 beneficiaries and members of the public participating in We Tech Care 2016. Held at JTC LaunchPad @ one-north, a vibrant and exciting co-working space for local startups, the half-day event created opportunities for people of all ages to learn coding and computing through IT workshops and talks; connect the current generation of innovators with the next through startup discovery tours; raise awareness of innovative technologies that can help solve societal issues; support digital inclusion programmes through partnerships with non-profit organisations; and foster Microsoft employees’ skill-based volunteering efforts. As part of the programme, President Tony Tan kicked off the 16th President’s Challenge this year in a launch ceremony. In his speech, he highlighted that since 2000, the President’s Challenge has evolved beyond financial support to address today’s social needs, which are more complex and social in nature. One example is bridging the digital gap of marginalised groups for them to keep up with the mainstream. By channeling more resources to address these gaps, the President’s Challenge hopes to provide them with the support, skills and confidence to lead dignified and meaningful lives. The President’s Challenge also promotes community interaction and integration. It looks to more public, private and people partnerships to help build a better support ecosystem in the community. Funds raised through this year’s President’s Challenge will be channeled to 57 beneficiaries across various sectors (See Annex B). Going beyond fund-raising, it rallies Singaporeans to not just pool together financial resources, but also time and skills. President’s Challenge also aims to boost senior volunteerism as a valuable community resource with the President’s Challenge Silver Volunteer Fund (SVF), which was announced last year. In 2016, for every S$10 donated to President’s Challenge, S$2 will be channeled to the SVF. The government will match dollar-for-dollar donations to the SVF, capped at S$20 million. 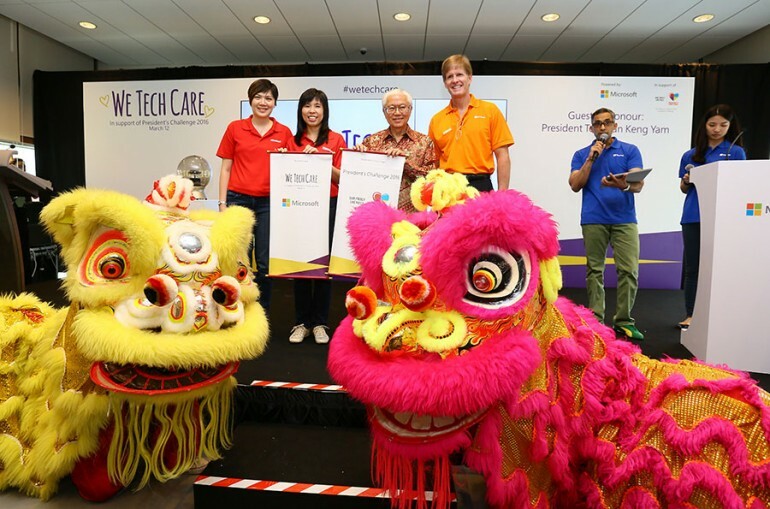 We Tech Care 2016 marks the start of Microsoft’s fund-raising activities in support of the 16th President’s Challenge, which raised a total of S$268,963 from Microsoft and its employees, partners and members of the public. President Tan accepted the donation cheque from Microsoft on behalf of President’s Challenge and other charities supported by Microsoft. He also met with Microsoft employees, partners, startups, non-profit organisation volunteers, as well as beneficiaries as he toured the event’s premises and participated in the day’s activities. “At Microsoft, we believe technology can empower every person and organisation to achieve more. That is why, in addition to raising funds for the 16th President’s Challenge, we are focused on empowering people across all ages with technology, with a particular emphasis on equipping the elderly and disadvantaged groups with technology skills to help them make a real impact for a smarter and more inclusive Singapore. By contributing what Microsoft knows and does best, we are heartened to see that close to 2,200 people with disabilities and 22,461 seniors have been equipped with practical IT skills. In the last two years, 55 people with disabilities have also been trained with vocational IT skills and 19 of them have gone on to find job opportunities in IT-related fields as a result,” said Ms Jessica Tan, Managing Director, Microsoft Singapore. “As Singapore works towards building the world’s first Smart Nation, technology will no doubt have a greater role in the lives of everyone living here. We are grateful for Microsoft Singapore’s continued support through President’s Challenge in making technology accessible to people with disabilities so that they are not left behind,” said Mr Abhimanyau Pal, Executive Director, SPD. “As a Microsoft YouthSpark Scholarship recipient, I am really thankful for the scholarship as it allows me to focus on my studies without worrying about my school expenses. With SPD and Microsoft’s support, I can now pursue a Diploma in Business Information Technology, with hopes of becoming a software developer in future to develop technological applications to help persons with disabilities,” said Mr Mohamed Najulah, Microsoft YouthSpark Scholarship 2015 Recipient. “RSVP is proud to partner Microsoft in its We Tech Care initiative. We want to see more and more seniors use IT in their daily lives. This is in line with government’s drive to create a Smart Nation for all,” said Mr Koh Juay Meng, President, RSVP Singapore. “As a volunteer with RSVP, I enjoy being able to use my IT skills to assist and empower seniors, providing them with a doorway to the wider digital world that can improve their quality of life; from free information to easily available entertainment. This has given me an immense sense of fulfilment and purpose which has helped ease my transition from work to retirement,” said Mr Ong Han Min, RSVP Volunteer. “At Guide Dogs Association of the Blind, we work tirelessly to empower people who are visually impaired to live full and independent livee through the gift of mobility – the simple right to be able to get around. In support of our orientation and mobility training and the provision of guide dogs in Singapore, we value our strong partnership with Microsoft – a partnership that through the Cities Unlocked programme seeks to leverage technological advancements to further advance our cause,” said Mr Amos Miller, Chairman, Guide Dogs Association of the Blind Singapore. “Partnering Microsoft for the We Tech Care 2016 event is a terrific opportunity for a health- tech company like Jaga-Me, as we bring top-quality nursing to homes on-demand. Besides showcasing our latest solutions at the event, we are also delighted to be able to meet non-profit organisations such as SPD and RSVP, who are making a difference in our local communities by helping the elderly and people with disabilities,” said Mr Julian Koo, CEO, Jaga-Me. Since 2002, Microsoft has tirelessly rallied support from its extensive partner ecosystem and communities in support of President’s Challenge. The total value of cash raised and software donated by Microsoft, employees and partners for the President’s Challenge and its beneficiaries from 2006 is estimated at over S$4 million. This year’s We Tech Care was made possible through the generosity and support of Gold Sponsors – Accenture Technology Solutions Pte Ltd and Avanade Asia Pte Ltd; and Bronze Sponsors – Challenger Technologies Ltd, Datapulse Technology Limited, and Dimension Data (Singapore) Pte Ltd. In-kind corporate contribution was also provided by Embrya and JTC Corporation. For more information, visit www.microsoft.com/singapore/WeTechCare and www.pc.org.sg.